Photo is of a N.E. Miles Jewish Day School student reading global stories of poverty and writing follow up questions. The N.E. Miles Jewish Day School seventh and eighth graders have started a learning experience focused on philanthropy and service to the community as part of the Abroms Youth Philanthropy, Social Justice, and Leadership Initiative. This initiative is funded through the Birmingham Jewish Foundation’s Abroms Center for Excellence for the N.E. Miles Jewish Day School. 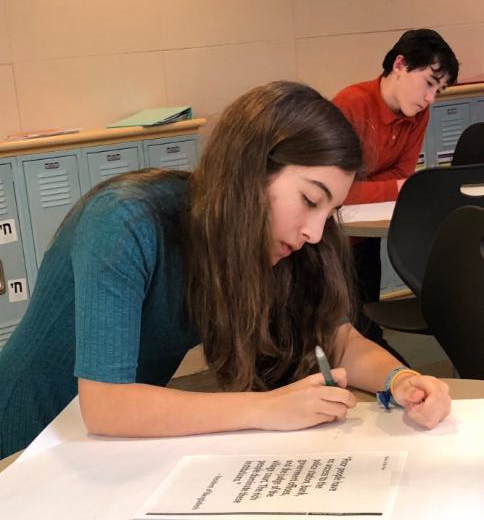 The group is using the American Jewish World Service’s “Where Do You Give?” curriculum which challenges students to confront and discuss difficult questions about their privilege and the existence of extreme poverty and injustice. This curriculum encourages our students to think about giving tzedakah (giving back) in a thoughtful, responsible way while inspiring them to make a life-long commitment to caring for their community. Students also will identify, through research and reflection, a non-profit organization they would like to support. The group will be fundraising throughout the year to allocate funds to the chosen organizations later in the year. Students will use the skills they learned last year in the Better Together Names, Not Numbers© project to create a short film to highlight their organization and the process of their service learning throughout the year. The Better Together Names, Not Numbers© project, an interactive, multi-media Holocaust project created by educator Tova Fish Rosenberg, is generously supported by a prominent national foundation. This inter-generational program provided an opportunity for students to create an oral history documentary and learn about the Holocaust from survivors who experienced its horrors. Click for more on the N.E. Miles Jewish Day School.